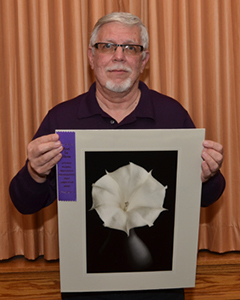 Lizbeth Guerrina and Joe Brady were Judges for our Winter 2012 Print Competition held in December 2012. 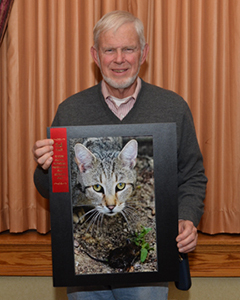 (Roll your cursor over the images to view the winning prints). 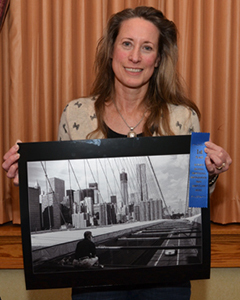 Judges’ Comments: Best in Show: Great tones – nice sharp image. It’s a beautiful print! The maker needs to have more room around the flower. The flower shouldn’t be centered – need to add more black space on one side. 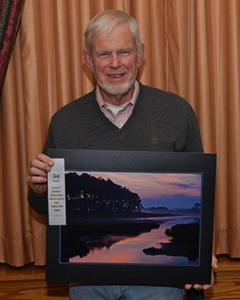 Judges’ Comments: First Place: This is a great image! The man is in the right spot in this picture, and the three pigeons next to him ties in with the Print’s Title. The only suggestion for improving this image would be to show more of the bridge in the foreground behind this guy . . . either by tilting the camera down, or perhaps stepping back a few steps. Judges’ Comments: Second Place: This is a beautiful print! Cat’s eyes are looking right at the viewer. The cat’s ears are too bright, make them a little darker so that the viewer’s focus will be on the cat’s face. Also, the mouse in the foreground should be made a little bit lighter. Judges’ Comments: Third Place: This whole print is very well done. Great composition with the leading lines coming into the print. The entire print is the Subject in this scenic landscape picture. The only recommendation I can make is to include the whole tree in the upper right in the background – showing only half the tree is somewhat distracting.